Tradewinds in Clinton is Pumped Up to Fight Cancer. 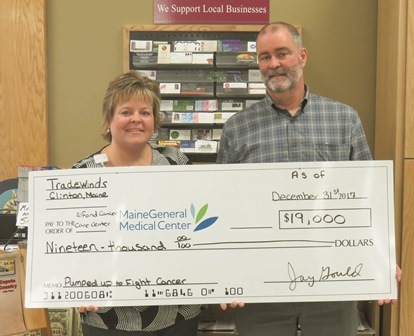 Since 2016 Jay Gould, owner of Tradewinds, has been sending a check to the Harold Alfond Center for Cancer Care (HACCC) that, all summed, totals more than $23,000 in support of our patient endowment fund which meets patients’ needs during a very trying time. Often without knowing, Tradewinds customers pitched in toward battling back against cancer one penny at a time with a cent for every gallon of gas pumped at this location adding to the now $23,000+ total in contributions. Jay is adamant that this money go towards meeting individual patient needs. Contributions like his help provide gas cards for those traveling to and from appointments, hotel rooms for overnight stays, gift cards for groceries, dental work – whatever the personal need may be.